CULTURE OF REVOLUTION · Intentional Destruction Laugh ALTHOUGH THIS BOOK glamourizes "chaos," the word's colloquial interpretation is synonymous with stress. All these changes are making work chaotic and I'm going to vomit. Okay, I added the "vomit" part, but this sec- tion is a note on laughter, so it's okay. When organizations encounter dramatic change or uncertainty, the stress placed on individuals can have a dire impact on performance. If you don't like my new idea then don't ask me for it. 156 Laughter can lighten the mood in stressful times. But it also serves a more important purpose: bonding. On the surface, laughter seems like a playful but uncontrollable outlet for human emotion. 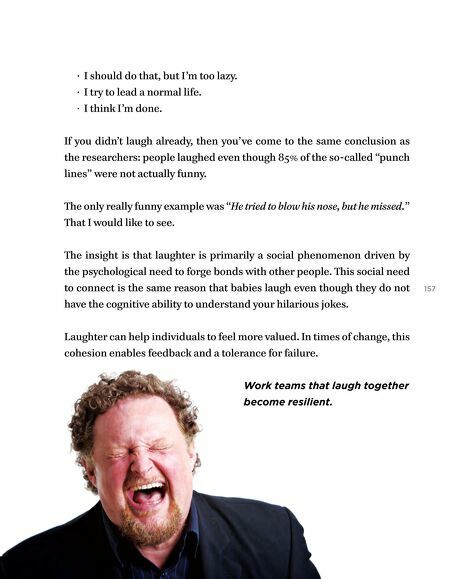 Diving deeper into evolutionary neurobiology, it be- comes apparent that laughter plays a critical role in human bonding. 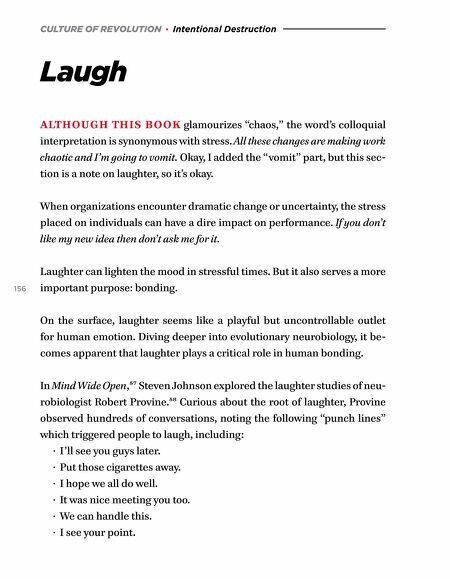 In Mind Wide Open,57 Steven Johnson explored the laughter studies of neu- robiologist Robert Provine.58 Curious about the root of laughter, Provine observed hundreds of conversations, noting the following "punch lines" which triggered people to laugh, including: · I'll see you guys later. · Put those cigarettes away. · I hope we all do well. · It was nice meeting you too. · We can handle this. · I see your point.